Ryder System, Inc. (NYSE:R), a leader in commercial fleet management, dedicated transportation, and supply chain solutions, today announced that it has been recognized by the American Red Cross for supporting the Annual Disaster Giving Program (ADGP). Ryder is also mobilizing its employees across North America to participate in National Preparedness Month (September) as the Company leverages this opportunity to promote and increase awareness around the importance of safety and disaster preparedness. As an ADGP member, Ryder joins a group of industry leading companies that have pledged a minimum of $1 million in cash, goods, or services over a two-year period. "As an industry leader in outsourced transportation and logistics solutions, safety and preparedness are priorities that we live by everyday at Ryder," said Robert Sanchez, Ryder Chairman and Chief Executive Officer. 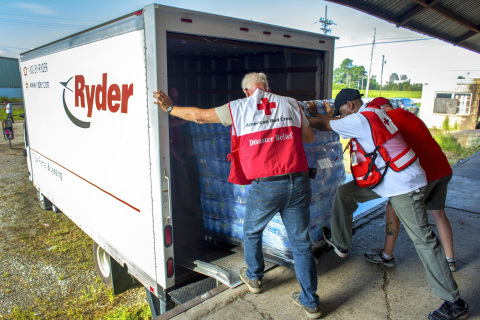 "This new $1 million pledge follows Ryder's long history of supporting the American Red Cross' disaster relief efforts, bringing our total commitment to more than $3 million in cash donations and other transportation and logistics related services since 2009. Ryder's contribution to the Red Cross' disaster giving program and our participation during National Preparedness Month were driven by our employees' desire to give back and make a meaningful difference." As an ADGP member, Ryder pledges its donations on an ongoing basis, in advance of major disasters, to ensure the Red Cross can respond immediately to meet the needs of those affected by disasters of all sizes. Red Cross services are provided to those in need of assistance at no cost and regardless of income through the generosity of Red Cross donors and the general public. "The American Red Cross relies on the generosity of our volunteers, donors, and partners to fulfill our lifesaving mission," said American Red Cross President and CEO Gail McGovern. "Thanks to the support of Ryder and other ADGP companies and foundations, the Red Cross can immediately respond to the needs of people affected by disasters whenever and wherever they strike." Each year, the Red Cross responds to nearly 66,000 disasters down the street, across the country, and around the world including home fires, hurricanes, floods, earthquakes, tornadoes, and wildfires. Individuals can help people affected by disasters by making a gift to American Red Cross Disaster Relief. Donations to Disaster Relief enable the Red Cross to prepare for, respond to, and help people recover from disasters big and small. Visit redcross.org, call 1-800-REDCROSS or text the word REDCROSS to 90999 to make a $10 donation.